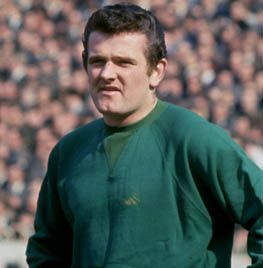 Tommy Lawrence was a stocky built Scotsman who was Bill Shankly's first choice goalkeeper. Lawrence had been at Anfield for five years when he got his opportunity in Liverpool's first season in the top flight after Jim Furnell got injured 13 games into the season. Tommy grabbed his chance with both hands and typically didn't let go of the shirt for the next eight years. In fact, Ray Clemence had to wait over two years to get the No.1 shirt off him. Having been a junior at Anfield, Tommy signed professional forms on October 30, 1957, a few months after his 17th birthday. Strong, brave and consistent, Lawrence was a reliable and fearless goalkeeper, even if he was affectionately dubbed "The Flying Pig" by supporters who felt he was carrying a bit too much weight! He only missed four league matches in six seasons as the Reds won the First Division Championship twice plus the FA Cup for the first time in the club’s history. Bill Shankly was reluctant to break up the team that had brought so much success to the club in the middle of the 1960’s but an FA Cup quarter-final defeat to Second Division Watford proved to be Tommy’s penultimate appearance in the Liverpool first team. Ray Clemence, who had made his league debut at Nottingham Forest at the end of January 1970, was picked for the next league match after that cup exit. Lawrence made the short trip across the river Mersey at the age of 31 to join Tranmere Rovers, shortly to be joined by his old Liverpool skipper Ron Yeats. Tommy added another 80 Football League appearances to the 306 he had made for Liverpool before moving on to non-league Chorley. He made one Under-21 appearance for Scotland plus three for their full international team.